When reading the other posts, it seemed that Aitken and Michel’s (1995) article did not receive many positive remarks, mainly for its lack of clarity and vagueness. Perhaps I spent too much time reading marginal continental philosophy this semester that made me more sympathetic to this piece. Although the article is more theory based, it examines pertinent issues of GIS that are still around today. The authors advocate for “all actors involved in the production and consumption of GIS to have some ownership in the creation of GIS knowledge” (17). They question the differences between the ownership of a process and the participation of a process. Power struggles are created when it is certain one group dominates the influence of the outcome over another group. If GIS is identified and examined as social constructions in this article, how will we change power relations to find a more equal (not perfect) opportunity in not only the process of ownership, but also the process of participation? According to the article, “a GIS cannot be divorced from the social context of its creation” (18). So how do we make the groups with ownership rights, socially construct an alternative way of increasing importance, and power to the ones involved in the participation process? One pertinent thing I do find frustrating with critiques is the depressing feeling I am left with after reading them. It is often easier to identify the challenges, rather than find useful and workable solutions. In addition to ownership, liveware is also a critical component to understanding power relations. It is defined as being comprised of the individuals responsible for the design, implementation and use of GIS, noting that it is hailed as “the most significant part of a GIS” (18). What responsibility and influence does this particular group have on the reality of GIS? How much of it gets convoluted in political agendas, territories (both academic and non-academic) that expect to be defended? How is the misrepresentation of facts, skewing of results, and meeting private agendas accounted for, monitored or, in the most optimistic scenario, eliminated? “What it is not clear is how the communicative and power structures which develop between the GIS creator and user affect the people whose everyday lives become metrics and data within the system, and whether indeed these people’s voices are heard at all” (18). Do we just get used to these power dynamics? Work our lives around them? I’d like to be a little more positive than this. A lecture inspired me to think otherwise. Andrew Pickering encourages us to “try things… experiment, and mess around with them”; an alternative to being stuck on one idea, or a particular set of definitions (especially when analyzing inequality) that confine us. This way of thinking seemed to parallel Aitken and Michel’s statement that “empirical studies of technological innovation reveal a complex, messy, and nonlinear process” (27). The authors appreciate the flaws of empirical studies, maybe because in some ways, the empirical studies bring the less tinkered with ‘real’ in GIS. Clouclelis (2005) outlines the rethinking of integrated land-use models by orienting the article around three main roles that are interconnected: scenario writing, visioning, and storytelling. The details of the article more than suffice the upsides and downsides of urban planning history with regard to the computational and spatial planning world. The one role that intrigued me the most was that of storytelling. Storytelling, according to the article, strives to “build consensus by presenting particular desired or feared future developments in terms meaningful enough to be credible to non-specialists” (1354). I believe it to be a significant connection between qualitative, and quantitative attributes of planning systems. Clouclelis notes that there is much room for “interpretation and facts” derived from models, however planning emphasizes interpretation and values, a much more arbitrary combination (from a scientific stance anyways). There is a specific comfort that we find when relying on facts rather than values. The concreteness makes them somehow more plausible and tangible than individual intentions and agendas, hence having “models codify uncertain knowledge” (1359). We hold planning accountable for a particular outcome. We expect it to “lead to certain action” (1359). The pressure only accelerates on planning to provide solutions to problems at hand. If we eliminate the jargon in expert language to enhance meaning to implemented models for the non-expert, we should develop methods that are creative, and can facilitate the process of finding a balance between non-specialist, and specialist interaction. What can we learn from both camps? In my opinion, storytelling in itself is not enough to be evocative. The way we tell it has to be compelling. Ideas, experimentation, and actions by means of imagination and sharing, can be significant contributions to successful storytelling. Another problem I want to address is the lack of clarity of what type of planning support system is indeed necessary, and in need of support (1355). The individuals, groups and communities involved all hold multiple agendas. “At the metropolitan level, transportation, commuting, growth, and sprawl cannot be addressed by one community without direct implications for several others” (1358). Will it ever be possible to address everyone’s needs? Is that feasible, realistic or practical? If that is not an option, will compromise be enough for a potential solution? Or will it be inevitable that certain groups’ requests will be sacrificed and overlooked? It is a good question to ask what is the most important component of GIS, or who contrives the ‘Real’ in GIS. In order to clarify this problem we come to a series of context and communication problems due to the large argument in this field. Critical theory has been applied in the paper published by Aitken et al. in 1995, attempting to clarify these problems. Authors present the relationship between communication and GIS development, but the changes of GIS in recent research should not be overlooked. Geographic information science, sometimes referred to a kind of toll making process, is largely impacted by the advance of new technologies. Here I only talk about the development of communication technologies in GIS research. Remote sensing, web 2.0, mobile technologies, all these technologies change how people obtain geospatial information and how they communicate with each other. With remote sensing, spectral information enables object based classification and data analysis, to utilize computers to extract geospatial information from satellite image data. Web 2.0, which provides a new platform for geospatial information exchange, begins to change how people access and contribute geospatial data. And mobile technologies enables the idea of GIS anywhere, with the development of cell phone, wearable computer, wireless sensor network, to name a few here. Another problem we should pay attention to in communication technologies is information verification. With the development of mobile technologies, GIS applications which collect geospatial information through text message begin to emerge (e.g., Ushahidi). However, there is no guarantee about whether the geospatial information provided by users is reliable. Therefore, information verification technologies should be explored in GIS, due to the large amount of information is impossible to check with human operators. In the paper published by Couclelis in 2005, the author presents a problem that attracts lots of research interests in GIS, the rethink about the relationship between the landscape modeling and the planning. Planning is a kind of strategy making processing, whereas modeling is mathematical and scientific process. GIS modeling process takes the previous data as input, and outputs the patterns extracted from past geospatial information. But planning is about the future strategies, we need to take the future into account based on today’s information. The gap between GIS modeling and planning brings numerous troubles in landscape studies, and this gap has been decreased by the development of technologies. Recently, the advance of technologies has brought great changes in the landscape modeling systems. For example, web 2.0 has provided a new platform for geospatial information exchange, which means users do not only get geospatial information for web 2.0, but they also contribute information for GIS studies. With the increasing number of web 2.0 users, the information collected with web 2.0 gradually plays a pivotal role in decision-making process. Another important factor that changes GIS modeling in landscape planning is visualization. Visualization technologies, especially 3D visualization in GIS, provide a standard view about the landscape. Compared with previous 2D technologies, 3D provides much detailed view about the landscape information. By viewing the 2D image, users may treat the landscape as flat and use their own information to imagine the true landscape. This may cause difference between people with different knowledge about designing and planning. 3D visualization significantly limits this difference by providing a standard view. 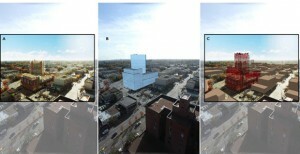 With remote sensing technologies and 3D techniques, detailed information that cannot be collected by the naked-eyes can be delineated, as the video demonstrated. There are many things I would like to discuss about the Couclelis article, but as I will be further discussing this tomorrow, I will leave it at this question: what is planning if there is no future? It was really interesting how Couclelis outlined that planning had moved away from considering the future; it is no longer strategic but operational and managerial. But then… is it even planning? What are we doing if we’re not learning from the past, testing in the present, and moving to the future? Surely a solution that is not seeking to make something into the best it can be is not the solution planners should be aiming for, anyways. Certainly there is uncertainty to consider, and many opinions (and narratives) to take into account. But one thing that is wonderful about planning for the future is the ability to make the changes we see in today that need to be made, and then learn from them as the changes are implemented. I agree with Madskiier_JWong when they suggest that uncertainties should not be dealt with linearly, but that a complex understanding is helpful to make decisions for the future. And while some may argue that complexities add more uncertainties, I would say they also add more possibilities. Oh, and one more thing: “Grassroots planning is admirable but it can only grow grass; someone or something needs to grow the fruit trees and the oaks of the future.” What a great line. It was interesting to read Couclelis’ article in conjunction with Aitken and Michel’s article, as they both highlighted the effect strategic planning has on communities. A frequent occurrence in urban planning is when community groups are given a few options or strategies to select from, the pros and cons of which have already been analyzed. This process, according to some, engages the public in the planning process. What often occurs, however, is that one or two of the options are portrayed in a positive light in comparison to the others. The natural, more logical choice for citizens, therefore, is the more attractive looking option, which is coincidentally the one planners wanted. This notion reflects greatly upon issues of promoting misleading information, which I discussed in my last post. I particularly enjoyed the aspects of Couclelis’s article that focussed on storytelling. I think that instead of constructing options or strategies for the public to choose from, engaging in dialogue to determine the wants and needs of the community (as well as the fears and dislikes), which then informs strategies and options is a much more comprehensive approach. The important difference between these two approaches is that the first merely attempts to achieve a specific goal, for example to reduce travel times along a transit corridor by (1) road expansion or (2) building rapid transit. The second approach, on the other hand, enables planners to question a myriad of objectives, which arise because of storytelling. This is sometimes referred to as the multiple objectives approach. In this transit project, perhaps it is discovered that reducing pollutants caused by vehicle emissions is actually the leading concern of the community. Preserving the character of the neighbourhood may be another major issue. From this approach, it may be understood that neither of the original goals may be suitable for the community, and that others should be explored. This inevitably increases the amount of effort required and creates a more complex planning process, but it arguably allows for more meaningful alternatives to be created. The importance of GIS is in modeling and comparing the alternatives generated by this method. The objectives stated by the community can be weighed against each other and models can be compared. For example, a GIS may aid in determining that all transit improvement options share the benefit of reducing pollutants by 5%. This feature, therefore, can be removed from the analysis and allow for better, more transparent comparison of options. I couldn’t help think about our lecture on agent-based modeling when I started to read Helen Couclelis’s article on coupling better models with land-use planning. I know that, here, Couclelis is thinking about a different kind of modeling than that often implied in agent-based modeling approaches. She first notes how “sour” the relationship between planning and the academy has gone (135). Then, after detailing the debate over whether or not a planning process utilizing models has any effect on actual land-use plans, Couclelis delves into how, in practice, actual physical planning has become a decentralized activity that doesn’t incorporate strategy (1357). I get it and I agree. The work being done on the ground, at least in North America, Couclelis argues no longer resembles any of the model runs done in academia. I think the quote Outdoor Addict utilized from the article sums up this problem well. In sum, the models have failed to predict the future accurately enough or, at least, keep up with land-use in practice. Even the “systematic effort to understand what makes certain things about the future predictable and others not, or how to prepare for genuinely unpredictable futures, have so far had only a negligible impact on land-use planning and modeling” (1360). So, what do we do? Perhaps this is the problem inherent in any modeling process. We do not know that the future will follow the path layed-out in a model. We do not even know that the models initial parameters catch all the various variables and their interactions. Clearly, although she doesn’t say it quite so directly, modelers in this field are struggling with this problem. As Madskiier_JWong points out, uncertainty is the name of the game when it comes to modeling or trying to predict the future (essentially what modeling is when you unpack all its sophistication). My suggestion: perhaps this is where agent-based modeling might come in. It seems from our previous lecture that agent-based modeling excels at representing lots of competing variables (or agents) and representing the emergent phenomenon that result from their disparate actions. In a land-use context, this might help us to better understand how certain sites might be used in future years and how they might handle such use. Couclelis does suggest this approach on page 1369 when she talks about assessing the cognitive and social dimensions of model interpretation so that modelers can move away from the macro level they currently operate on. Yet, she doesn’t devote much time to it, and such an approach doesn’t fit within the confines of models she describes that try to predict varying types of land-use cover and changes to infrastructure. But it may add a valuable dimension. A quick search online shows that many people are, indeed, already trying to couple these two ideas. I don’t have a background in planning, so have relatively little to comment on Couclelis’ article. What I don’t understand is why planners have abandoned the strategic approach, and instead focus on what seems to be contemporary problem mitigation. Sure, there have been failures in strategic planning – some of those new towns and new housing projects in the UK come to mind, but how are we supposed to try to implement values of sustainability and similar without such an approach? I’d also like to ask, where does GIS come into this article? It certainly comes in when the author throws around statements like “[planning should be] better integrated with certain informal techniques designed to promote its normative and future-oriented dimensions”. Wait a minute…normative dimensions and GIS? There are some things GIS can and cannot do. How are we supposed to take a ‘normative’ approach when planning with GIS? When you put an input into a model and get your output, should it have some kind of normative quality to it? How does a model even do that? I’m not saying that a model is necessarily positive – your output is just more likely to be occur when following a certain set of constraints, but how do we generate output that promotes the normative dimension of planning? Aitken and Michel’s article bothered me. Perhaps I read their intentions incorrectly, but as some other posters mentioned, they seem to be slightly overreacting. They spend the paper discussing how GIS can only further empower the hegemony of urban planners: deconstructing the failings of urban planning and those who plan, and making explicit the ways GIS will facilitate the “oppression” and blindsiding of the people whose communities are planned. And yet, GIS as a science, like any science (like planning! ), has bias inherent, is limited to those who understand the language, can afford the systems… and yet is carried out nonetheless. And GIS as a tool, (as is implied here), like any tool, is neutral–it can be used for good or for evil, as they say. So I take issue with the constant denigration of the use of GIS as it is today. Wouldn’t any tool be just as dangerous? And haven’t urban planners (and the politicians behind them) been planning for years (without GIS as we know it today) with ill-conceived ideas of how a community should be, how people want to live–if Pruitt Igoe is any evidence, I would argue many have. Additionally, however, Aitken and Michel wrap up with how “the GIS community may enable those affected by planning contexts to speak for themselves”. This seems perhaps a redemption for GIS. Allowing people who aren’t planners into the equation, expanding the context of GIS, may make it useful after all. But then they sum of with this. “Clearly, there is a need to demystify the specialized speech and practice of GIS… it is beyond the scope of our discussion to elaborate on how training and access to GIS could be provided to all people affected by a planning context. Nor is it possible for us to delineate fully the myriad of ways the institutional structure would have to be changed in order to accommodate equal access to GIS”. So they introduce all the problems, but refuse to really address any solutions, and that is where Aitken and Michel lose me in their fight (for?) (against?) GIS. In the 1960’s an 70’s, GIS models—guided by rational instrumental planning processes—put the needs of the economy before citizens. This occurred in the form of massive urban renewal projects and, according to Stuart Aitken and Suzanne Michel, a lack of dialogue and communication was to blame. In accordance with the Chicago School of urban ecology, laws and models were derived, which revealed the secrets of urban dynamics. In order to position the community at the centre of the planning process and to avoid planning mistakes of the past, Aitken and Michel posit that GIS must be fully recognized as a tool in a process and the community should always remain at the centre of discussion. Does this process, then, transition GIS from a science to a tool? While it is often assumed that the role of GIS in the planning process is an objective one, I feel that our current planning practices still rely on the rational instrumental planning process. As an example, the subject of misguiding community residents reminded me of a residential development project currently under way in Vancouver. Plans were made by the developer and formally submitted to the City. At some point in the proposal process, the project’s renderings—which were meant to address resident’s concerns that the building was too tall—were identified by local residents as inaccurate portrayals. As one can see in the images below, the developer’s representation of the project (A) is quite different from the city’s (B) and even more so in comparison to one made by a community member (C). Aitken and Michel posit that individuals and/or organizations manipulate communication in order to legitimize political agendas and to exclude community members and I think that this development project is a good illustration of this occurring in real life. Using this as an example, I agree with Peck in that citizen awareness is crucial in understanding the planning process. If it were not for educated citizens who understood the role image manipulation has, the inaccuracy of the renderings may have never been realized. I believe, however, that it is also the role of planning organizations to properly inform citizens, and I think that is where the authors’ concerns arise. A GIS potentially enables the spreading of skewed information, and this brings us back to the role of communication. Because a dialogue was in place with (informed) citizens, the planning process (and, therefore, the role of GIS) was arguably improved. Further, because data manipulation was caught, the marginalization of more locally grounded public discourses—those trying to gain “footholds in the planning process” by using accurate portrayals—was avoided. I feel that Aitken and Michel are slightly overreacting. “GIS Hegemony in Planning”? Those are some strong words right there. I feel that this article may be a bit outdated, having been written in 1995. Indeed, the cited predictions about the future net worth of the GIS industry were gross underestimates. 600mn systems and 6bn USD global industry worth? That’s nothing. According to a Wikipedia article (original source no longer available – yea I know), the GIS industry is was valued at 400bn yuan (63bn USD at current exchange rates) in 2007 in China alone. I don’t know whether the authors were truly appreciative of what GIS has done for us, and so instead chose to focus on criticising it. One of their issues, if I understood correctly, was that GIS systems give too much ‘authority’ to those that use them. GIS has made doing analysis and making maps very quick and easy to do, and increased accessibility of GIS software/hardware has enabled more people to do such analysis. The authors worry that we trust in the output from the people using GIS too much. That we don’t scrutinise the underlying methods and assumptions, and that we are merely pushing buttons instead of thinking about what we are doing. In response to their urban planning examples of failures due to over reliance on GIS models, I would say that it is merely a matter of education. The kinds of models and assumptions you get in GIS are based on other domains such as urban planning, so blaming GIS will only get you so far. If you know your urban planning theory or ecology or whatever subject, you will be able to look more critically at: whether the output matches established theory, and whether the computations done in the GIS was appropriate. If you want people to truly understand what’s going on, then they have to educate themselves. GIS though, can still be useful to those with rudimentary knowledge. Many make use of statistical tests without trying to remember the exact formulas behind them. All they have to remember are the required inputs and how to interpret the results. In terms of planning – there will still be an urban planning expert sitting behind that GIS, doing the analysis. For that person, the GIS will be an extension for the field of urban planning; an enabler for the researcher to do more things more quickly. Even if they look at GIS as simply a tool, they will still understand how it works. If they don’t, then the city council should hire someone else. Another problem they had was that the ‘interested citizen’ does not get fed all the details, but instead just gets filtered information prepared by others. Again, this is another area where the article may be out of date. Right now, it is much easier to get hold of data than in 1995 due to the internet. Whether or not information is released is not a reason to blame GIS – rather, these tend to be more legal issues that should not be in the scope of CGIS. The article written by Couclelis on models and their role and integration into land use planning states that the “systematic effort to understand what makes certain things about the future predictable and others not, or how to prepare for genuinely unpredictable futures, have so far had only a negligible impact on land-use planning and modeling” (p.1360). This statement suggests to me that land-use planning and modeling are not considering the complete picture in that the assumptions held are that one can predict the future and that when one is not successful, some reasons for the failure are not considered. The two issues mentioned in the quote both relate to our acceptance and greater consideration of uncertainty in the future which I feel should be very carefully examined when attempting to plan for the future. Relating this a little to critical GIS, if we fail to consider all factors underlying a system, it would be negligent particularly from the science side with the modelling, and the final product could be altered and manipulated to send a particular message. I enjoyed reading this article and see many parallels between the author’s arguments and the goals of critical GIS. Couclelis argue that planning has lost its future-oriented approach and is absorbed by operational and managerial tasks. She urges planners and modelers to incorporate scenario writing, visioning and storytelling into PSS. Although I understand the gist of PSS, it would have been helpful if the author had offered a description of what the system consists of. How is it different for conventional GIS software? Are there functionalities that allow easy integration of scenarios? The 3 methods advocated in the articles are qualitative in nature. “Models are based on science; planning is about policy” (1359) indicate a tension between quantitative and qualitative approaches. This exact tension experienced by GIS practitioners and social theorist is what gave rise to Critical GIS. Large amounts of work is being done in Qualitative GIS with the goal to incorporate different types of data into GIS, such as in-depth interviews, ethnography studies, emotions and even sounds. Some researchers have also employed mixed methods, that is, using quantitative and more personal qualitative datasets. I will refrain from saying too much here because I will be taking about it tomorrow. This are in Critical GIS is definitely promising for scenario writing, visioning and storytelling. On another notes, Couclelis writes, “Land-use and land-cover change are themselves issues spanning the local-to-global spectrum so that changes at one geographic scale may have significant repercussions at several other scales and times” (1358). 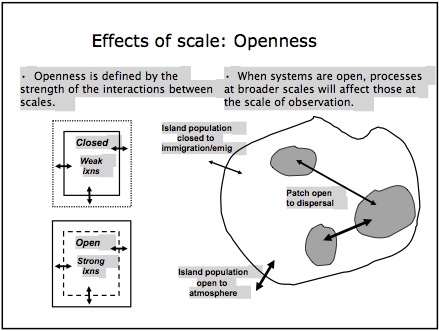 This idea of events having effects for multiple scales was brought up during the lecture on “Scale” [Figure 1]. To be able to define and visualize these inter-scale interactions in GIS will be increasingly important as the world becomes more connected. This capability will allow us to get a more complete picture of consequences from a certain disturbance/event. For example how “open” is the city of Longueuil to changes in immigration trends from Asia? Or from changes from consumer preferences living in Germany? Analysis like these cannot be easily carried out in GIS because the system requires all the layers to be in the same scale. When will GIS be able connect places on two different map that do not match in scale? The critical GIS article by Aitken and Michel brought forward once again the concept of homogeneity in GIS through the proposal of having a universal GIS which would be “flexible enough to accommodate the demands of locally based, micro-scale uses”. I would generally say that I don’t believe that any type of miracle universal GIS could be created to deal with planning issues anywhere on the planet particularly if the GIS were produced by a single company like ESRI or SPANS. As far as I know (feel free to let me know otherwise!) companies are out to meet user needs and to make money and to do so, they must cater to their users but arguably only the majority of their users in the interests of time and profit. What I wonder is: could the geoweb play a role in producing a GIS that caters to a far broader variety of users and allows these users to build on the GIS to improve it for specific purposes and, in the context of planning, for specific locales? The paper does not deal with this concept likely due to technological evolution since it was written in 1995. At that time, users could access the internet but not necessarily contribute to its content in any way. Today, users can create vast amounts of information as well as software and this kind of power could be harnessed to create a universal GIS with many components for a variety of users, uses and places. Another necessary aspect of a universal GIS is that it would have to have different possible levels of analysis to serve the experts and the naive users. This would in turn rely on both experts and naive users contributing to the online GIS, something that may not happen. Additionally, such a GIS would not be capable of ensuring naive users are using the level of analysis geared to them as opposed to a higher level for research purposes. To assist in solving this problem, I would say users need to be educated about GIS and how to use it but that perhaps if they chose not to learn all the technical details, they could still use the level of the GIS geared toward them. Couclesis’s article on planning support systems appears to contradict the communicative model of Aitken’s piece on critical GIS. Couclesis argues that planning models have suffered a trade-off effect of including public sentiment in brainstorming sessions at the expense of hard expertise. The author draws a sharp distinction between the social fluidity of planning and the technical-objectivity of models. I am uncomfortable with the assertion that participatory planning has a negative impact on the scientific and expert rigor of its products. The more relevant issue is inviting and drawing in an appropriate audience for the task at hand. Locals of an area have detailed knowledge of how processes affect them that rivals scientific knowledge. More often than not, their reporting of changes in the system is more timely and appropriate for model corrections than scientifically verified corrections (the convenience and fitness vs. rigor and accuracy argument). The challenge, as Couclesis points out, is to ensure the mutual cooperation of public and experts. As a geographer it also seems silly to paint experts as divorced from the social implications of their work; wouldn’t experts be the most aware of the limitations of their work? As GIS-users, wouldn’t experts also be grateful for the wealth of knowledge VGI and cooperation with the public produces? Finally, the author’s suggestion that “neither the reactive response to changing circumstances nor the futile reliance on forecasts built on variations of business-as-usual scenarios can deal with the mix of pattern and noise that is the future.” initially confused me. It represents a key understanding though that linear extrapolations are insufficient for temporal analyses since one change may have a disproportionately large impact on other factors in the future. In such an unpredictable case, aggregating to a larger temporal scale is a step in reducing uncertainty. A more bold approach may be to rely on a mosaic of deep local understandings to represent a process across a larger extent. Such a method would be incredibly dynamic and may produce counter intuitive results such as those revealed by agent based modeling. there have been steps to create interfaces that do the opposites of the above, by re-integrating community members in the planning process. From my research, I feel confident that eventually, with the improvement in HCI, and a more integrated development process, the power that GIS currently possesses will be shared between people in positions of power, and the collective, community. Elephant using a tablet computer. The article on critical GIS strongly emphasizes the subjectivity and human fallibility in GIS. The authors call for a more communicative, open, and inclusive approach. Their concerns appear to lie in the construction of truly participatory GIS that is open to all for exploration and examination at all steps. I agree with ClimateNYC in that this reading seems to have circled back to our original debate of GI science vs. GI system. Through all of our class lectures, a new (to me) perspective is viewing the problem as an issue of public perception. The authors emphasize a strong divide between experts and novices to GIS, and I agree based on the learning curve of writing custom scripts/functions and variable recognition of the data’s limitations. Aitken and Michel’s call for a more “communicative rationality” seems to question the necessity of such a debate and pushes for a merging of the two. A quick note: at the beginning of the course, I stood on the GI science side of the fence. The general trend of development in GIS functionality has been to make processes more accessible and user-intuitive. This has been shown in the cutting-edge human-computer interface examples shown by Peck. Simultaneous and interactive multi-user visualizations work towards this goal at the software level. These design challenges necessitate frequent debate and exchanges with users to optimize the systems for as wide an audience as possible. The life-path of computers is a helpful comparison. They originally started out as expensive, feared research-oriented machines found only in the cloisters of MIT and government agencies. Curious techies got involved with programming and hardware development and became the first “hackers”. The development of games and minicomputers were truly pivotal moments in popularizing computers.The quick adoption of geospatial tools such as Google Maps and the GeoWeb is the popularization parallel for GIS. Application and theory will become increasingly intertwined with more intuitive tools available and may lead to a redefinition of the importance of place (in a digitalized world where the friction of distance has been lessened). At the end of the day, the increasing accessibility of data may make GIS an example of a science submerged in the social realm. Computer science still remains, and it is likely that GI science will as well. Concerns about underlying politicization and deceptive “objectivity” will fade as GIS methods become more and more ubiquitous. This reading has further shifted my views on GI science vs. GI systems towards a middle ground, and whether it is realistic to view the science-system as separate components. So, I had a few problems with the article by Stuart Aitken and Suzanne Michel. First, I felt like the authors danced around the delicate topic of whether GIS operates as a tool or as a science in a way that was detrimental to understanding their article. Second, I wondered about applying Habermas’s theories to the idea of “planning” by making it a consensus built on mutual understanding and arrived at through respectful communication. But let me back up, first, and give a brief summary of the article. The authors frame their writing as being in response to the troubling idea that GIS is defined solely outside of social constructions that “bolsters a rational-instrument discourse in planning” (17). In contrast, they believe GIS to be a “socially constructed” technology (27) that when used in planning should not impose one person’s agenda on others (24). As such, they worry that some GIS lord sits on high, owns the process of planning, and only allows others to engage with GIS as participants rather than having any ownership of the planning process. Such a process risks defining GIS theoretically in such a manner that makes it an exclusive field of scientific research or practice. How the author’s defines GIS as a science or tool could potentially be very important in the discussion I describe above because it seems to be wishy-washy in terms of their view of it. On the one hand, they talk about GIS in terms of the planning process and how administrators and others use it to aid in planning of development or other projects. In this sense, it appears to be a tool. However, when the authors get into discussing Habermas, they start to deal with GIS as a field of research that has underlying theories, and to argue for a more inclusive field that includes disparate voices. In this sense, they argue for merging the academic and professional worlds into the world of everyday experience – which I agree with – in order to give average folks ownership over the field of GIS and how it operates. So, this brings us back to the question that could easily be answered if they define GIS as tool or science. How does planning become an open, inclusive process? If we’re thinking about GIS as a field of research, it’s got unique potential to include a variety of user inputs or applied insights. In many cases, planners and those responsible for making decisions about urban plans do utilize GIS in this manner to gain insight into how better to make their decisions. I mean just look at this video where GIS applications are used in urban planning decisions acroos Addis Ababa. Plus, it’s got some good music. Yet, I can’t help remember the days I spent as a political reporter and the dread I felt covering county votes on comprehensive land-use plans or even planning commission meetings. These meetings were almost always exclusive to those in charge (Ok, I guess the elected officials did answer in some manner to those who elect them) and subject to the prevailing views of whoever those in power might be. Sometimes, unfortunate homeowners who wanted to build something not accounted for in county plans might have been subjected to some type of harassment by the planning commission or, otherwise, be included if they could justify their new add-on to their jumbo mansion. On really good days, the planning decision might be incredibly divisive (since I worked in Northern Virginia, this mostly only occured when slow growth advocates were pitted against pro-growth folks) and the decision-makers had to come down with some type of politically defensible decision. But the point is clear. While GIS as a science might have the potential (and in many cases is already) democratic, the planning process in many urban localities is far from it – at least not beyond the sense of being representiationally democratic. So, can GIS bridge this gap? Maybe. But I guess it depends on whether you view it as a science or a just a tool for some government planning board. Vincent Van Gogh in hi res simulated model of ocean currents from NASA/GSFC. You are currently browsing the Computers, Society, and Nature blog archives for March, 2012.